Lucky Red is a well-known casino that offers high quality gaming solutions from RTG, an extensive bonus program and versatile payment options to suit all kinds of players. To make entertainment more comfortable, the casino has put in place the best practices in security, safety and fair gaming, so players can enjoy a trouble-free fun any time via a desktop or mobile device. With other 120 games available in a free mode and for money, Lucky Red is an ultimate gambling venue for all enthusiasts of roulette, slots, blackjack, poker, and more. Whether playing for free or real cash, a user needs to sign up first. After a successful registration, a user may opt for playing an instant browser version or download the casino, with both options having very slight differences in terms of functionality and a range of games. The full list of deposit and withdrawal methods consists of 4 and 7 payment services, respectively. 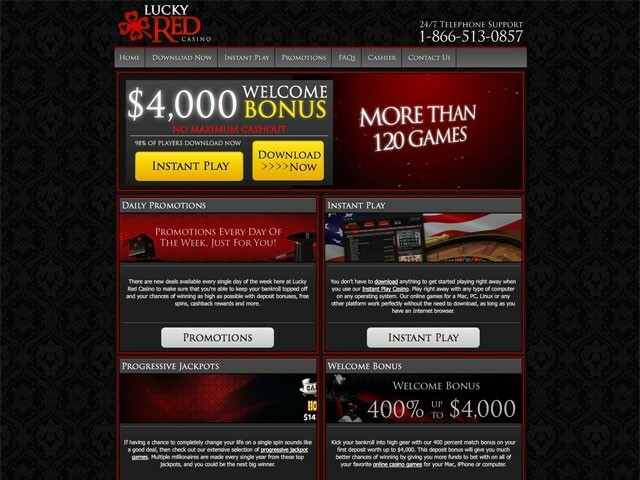 Lucky Red has set the following payment-related limits: $35–$1000 for deposits, and $20–$5001 for cashout transactions. Gamblers residing in the USA are accepted in the casino without any limitations whatsoever, though the casino do have a list of countries, the players of which are not entitled to register there. Multiplayer Roulette. Putting a social twist to a classic French roulette, the developer has presented this Multiplayer Roulette enabling players to interact around the table, choose a table type (private, open or reserved) and table limits, and more. Lucky Red features seven daily bonuses that cover all days of the week, but unfortunately for roulette fans not all of them can be played through in roulette games. Among the bonuses that are applicable to roulette variants are: Wednesday 66% match up to $1000; Thursday 65% or 75% match up to $200, and Sunday Unlimited 70% match. All the bonuses are subject to a x25 times playthrough requirement (B+D) before a player is allowed to cash out the bonus amount. Roulette contributes 40% towards the WR.